I’m a HUGE fan of Renegade Rows. I mean, who wouldn’t want an exercise that can bulletproof your shoulders, strengthen your core, and make you feel like a superstar athlete all at the same time? If you’re a rotary sport athlete (i.e. golf, tennis, baseball, etc.) Renegade Rows will give you the anti-rotary stability that’s necessary to perform at a high-level. And as strength athletes, Renegade Rows will give you a super-strong core, while making your training a bit more athletic and fun to boot. In this short video, I describe how to execute the exercise, and drop a few subtle coaching cues to help you get the absolute most out of this awesome exercise. Like any push-up variation, get into a neutral spine position. If necessary, watch this and use a PVC pipe to give you some kinesthetic feedback. Take the feet out a bit wider than you think initially. This will give you a bigger base of support, and make you less likely to rotate. Reach LONG with the down arm. This will engage the serratus anterior, and help improve core activation. 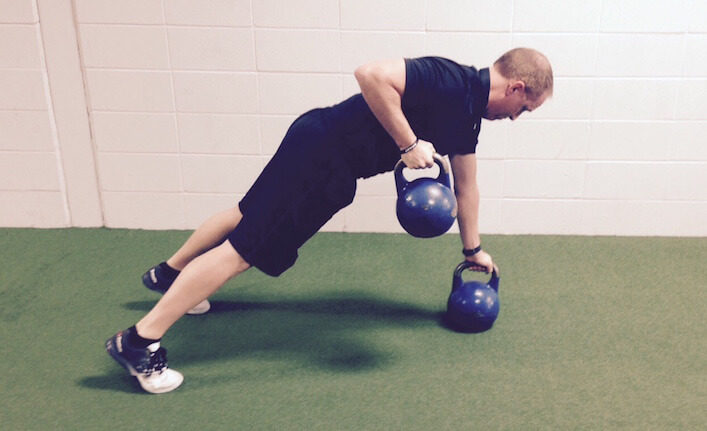 While reaching long with the down arm, think about locking down the midsection and rowing with the “up” arm. Give the Renegade Row a shot the next time you’re in the gym. I guarantee you’ll love it as much as I do! Are there progressions you use with the renegade row that incorporate rotation or any other progressions in general? Kip – Admittedly the biggest progression I use is to increase the load. You can also make it more difficult by narrowing the feet (i.e. the base of support). As far as regressions go, you can do this much like an incline push-up with the bar in a power rack. I thought like you, maybe because some people do this exercise with rotation (gym magazines…). But now, I think the anti-rotation condition is more useful for improving our core (and more safe). Notice what Mike said “Abs tight, NO rotating, stay STABLE”. It’s like a plank. I love this exercises and use it with our athletes a lot in the way you just explained it. A useful regression, which I have just called the modified renegade row, is the same movement without the weights. Find it a good stepping stone the weighted variant.